The Israeli security industry affects lives everywhere. As an outcome of Israel’s immense financial investment in military and security technologies, its image as pinnacle of security expertise and its ‘combat proven’ weaponry, Israel is a huge player in the global security market that is flourishing like never before. Israeli technologies, knowledge and actors spread all over the world, accompanied by ideas about the ‘other’, including of the Palestinian as dangerous ‘other’ and as Muslim threat. Tools to subdue this ‘other’ and to fight multiple sorts of constructed ‘enemies’ are sold by Israel on a global market. As such, the Israeli, discriminating security philosophy and its technologies that have been developed to be used against Palestinians are brought to many countries and used against many different unprivileged around the world. This three-day symposium Securitizing Worlds aims to offer an interdisciplinary, critical overview of these practices and their effects as well as at the current struggles against them. Prof. Nadera Shalhoub-Kevorkian – Lawrence D. Biele Chair in Law at the Faculty of Law-Institute of Criminology and the School of Social Work and Public Welfare at the Hebrew University of Jerusalem. Eitay Mack, Israeli human rights activist and attorney. Shir Hever, PhD candidate at the Free University of Berlin and political economy researcher of the occupation. Ghada Zeidan, expert on Middle East politics (Israel/Palestine in particular) and Dutch and EU Foreign and aid policies in Palestine, founder and director of Palestine Link. Erella Grassiani, anthropologist at the University of Amsterdam, co-founder of gate48. Itamar Shachar, member of ‘Intal – Globalize Solidarity’ and PhD candidate at Ghent University. Round table with Amir Yatziv, Video Artist, Galit Eilat, Independent Curator and writer and dr. Noa Roei, researcher of Militarism and Visual Culture at the University of Amsterdam, board member of gate48. The Lab is an investigative documentary revealing how the Israeli military occupation in Palestine has become a business rather than a burden. 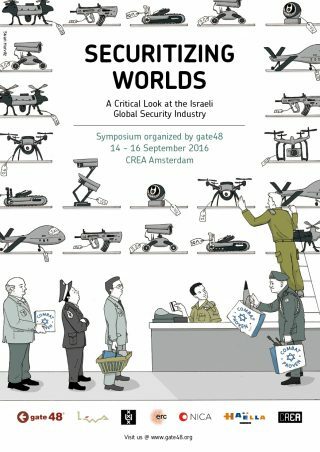 Securitizing Worlds: a Critical Look at the Israeli Global Security Industry is organized by gate48 (Critical Israelis in the Netherlands) and made possible with the support of the Leonhard-Woltjer Foundation, SECURCIT (European Research Council); NICA (Netherlands Institute for Cultural Analysis), UvA, Stichting Haella and CREA.